This is not a quick and easy read. At least it wasn’t for me. But this is potentially one of the most important books you may ever read. The is one of 4 or 5 books I would like to see in everyone’s library. More importantly, I’d like to see it in the hands of every “young” person between 18 and 30. I totally believe the future of the world as we know it depends on the issues addressed in this book. 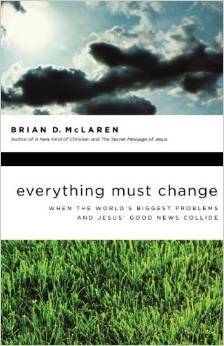 “Everything Must Change” is written by a Christian, predominately to a Christian audience (although many fundamentalists doubt this target audience is “Christian” to begin with). But, the issues and principles here apply to every human on the face of the planet. And they effect every human and non-human on the face of the planet. * The Prosperity Crisis – Environmental breakdown caused by our unsustainable global economy. One that does not respect environmental limits, while creating great wealth for about one third of the world’s population. * The Equity Crisis – There’s a growing gap between the ultra-rich and the extremely poor, most of whom are growing in envy, resentment and hate of the rich. The rich become fearful and angry as they seek to protect their wealth. * The Security Crisis – The danger of war arising from resentment between the groups at opposite ends of the economic spectrum. * The Spirituality Crisis – This is the failure of the world’s religions (especially Christianity and Islam) to provide a framing story that could bring healing or at least reduction to, the previous three crises. In one section, Mr. Mclaren likens our past religious attempts at understanding to those of someone piecing together a puzzle. We’re trying to fit it all together according to the picture on the lid. The problem is, we have the wrong lid! In chapter 4, a young man from Khayelitsha, South Africa, delivers a very weighty message to a group of pastors and evangelists from America. It is a message every pastor and evangelist needs to hear. If you’re a “missionary,” please read this chapter. Even if you don’t want to buy the book, borrow it from the library. Borrow it from me. Just read this chapter. It seems many people shy away from politics and religion. As Brian states, “A lot of us are very happy to go through life knowing as little as possible about economics, politics, and ecology.” The thing is, these are both the problem, and part of the solution. For me personally, my politics are intrinsically tied to my faith in Christ. Yes, we pray. But then we help bring God’s will “on earth as it is in heaven” by taking action: Action that can help bring about equality, justice, and environmental responsibility. I believe a proper look at the teachings of Jesus will reveal that very thing. If you’re someone who cares about the future of your children, your children’s children, and so on; I would suggest you read “Everything Must Change” and seriously consider the message it contains. – Not only am I often unsatisfied with conventional answers, but even worst, I’ve consistently been unsatisfied with conventional questions. – Part of what it means to be “a new kind of Christian” is to discover or rediscover what the essential message of Jesus is about. – Many of our religious institutions have taught us to see no horizon for the message of Jesus beyond the soul of the individual. – The way of the kingdom of God calls people to a higher concern than self- or national interest: namely, concern for the common good. – We can no longer deal with global problems as discrete unrelated issues. – Jesus bursts on the scene with this scandalous message: The time has come! Rethink everything! A radically new kind of empire is available. – Theocapitalists have tended to see the rich as morally good and the poor as morally culpable for their own poverty. – Many of our current eschatologies, intoxicated by dubious interpretations of John’s Apocalypse, are not only ignorant and wrong, but dangerous and immoral. – We don’t have a violent “Second Coming” Jesus who finishes what the gentle “First Coming” Jesus failed to do, but we have a poetic description of the way the gentle First Coming Jesus powerfully overcomes through his nonviolent “weakness”, a prince of peace whose word of reconciliation is truly mightier than Caesar’s sword.